CHRS Radio Day By The Bay – LIVE! 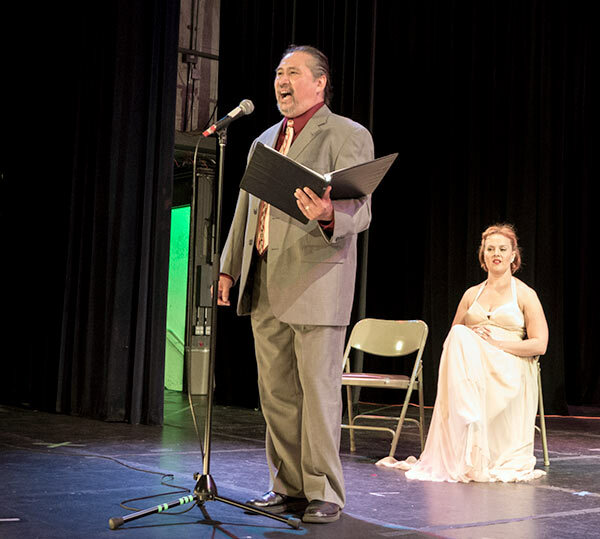 In Alameda… A Terrific Success! 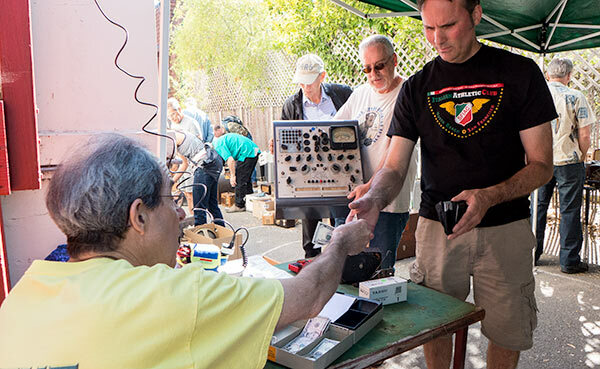 Recently held on July 26th 2014, Radio Day By The Bay is the main yearly fundraising event for the California Historical Radio Society and its’ programs, the Bay Area Radio Museum on-line, the Bay Area Radio Hall Of Fame and the Society Of Wireless Pioneers. This year presented many obstacles for a successful Radio Day. 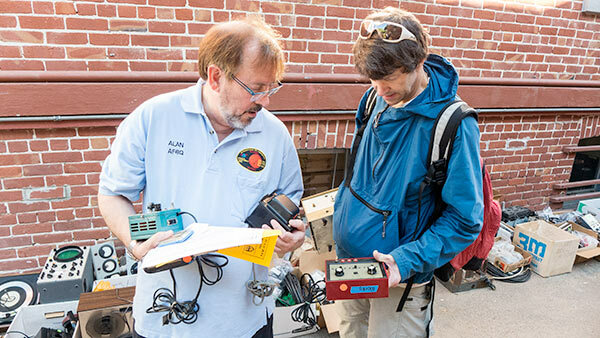 We usually start planning in February, but we were in the midst of trying to buy a building near downtown Alameda and moving the contents of KRE into 2152 Central Avenue, CHRS Radio Central. 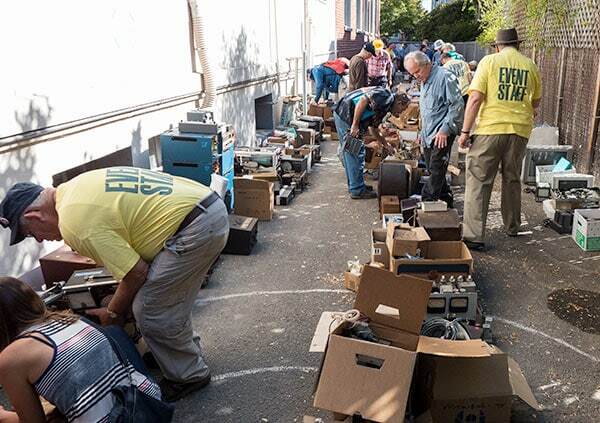 Then the purchase, the asbestos abatement, our collections still packed in 1500+ boxes, primary interior demolition and planning for the KSAN – Jive 95 Era events in June delayed planning for Radio Day until June 5th. But with lots of help and support we pulled it off. It took a dedicated team to make this happen. For the previous nine years CHRS held Radio Day events on a small stage outside KRE. Now we found ourselves in a mixed-use residential neighborhood without that possibility. So our solution was to hold our event at two locations. The historic 2000 seat Kofman Auditorium; part of Alameda High School is just a block away from Radio Central. This traditional theater built in 1926 was perfect for our needs. All activity from the Kofman was streamed Live on-line thanks to Dave Billeci and Philip Monego. Again this year our Master of Ceremonies was KCBS’ Stan Bunger, BARHOF Class 2010. Stan who is a long time resident of Alameda stated how pleased the community is to have CHRS as their newest Historical Society. 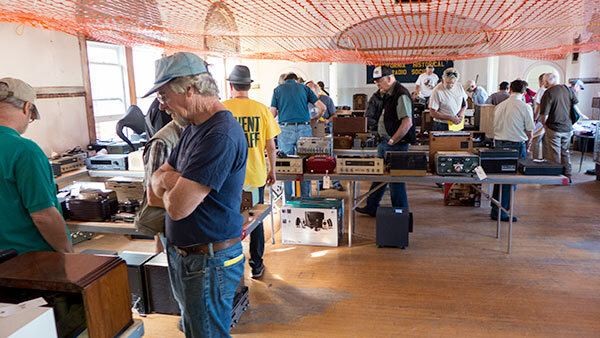 Our auction of 180 Lots this year contained much high-end hi-fi gear as well as vintage radios. 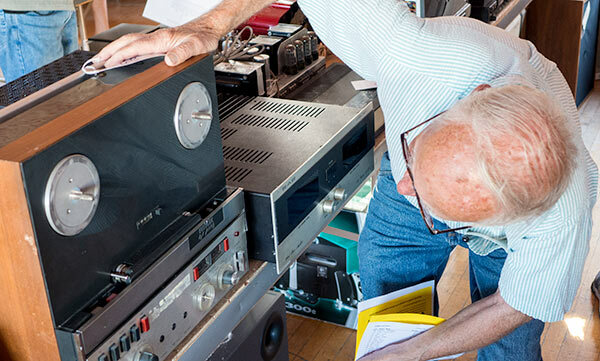 Our CHRS technicians spent many hours testing and repairing this gear for the auction. 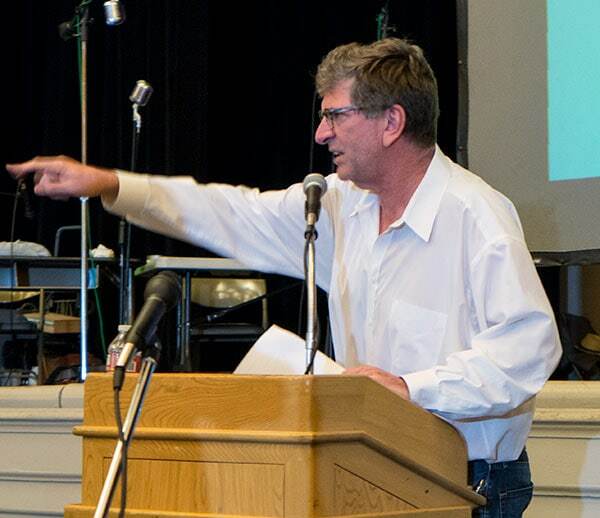 Guest auctioneer KGO’s Peter Finch expertly called the auction, kept things moving and kept bids climbing. CHRS Chairman Mike Adams called the last segment. Over 2/3 of the Lots sold. We projected images of the items at the Kofman and the items themselves could be inspected down the block at Radio Central. 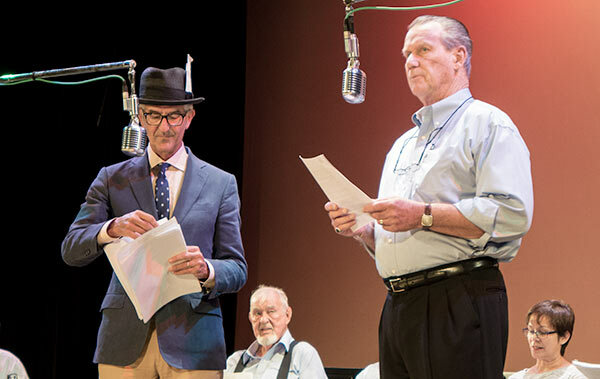 The Kofman is a great venue for a Live radio play and the Broadcast Legends once again came through with one of their best ever. Jim Schock’s 1900 newscast was from the year Radio Central was built. 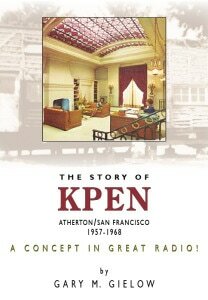 It was skillfully delivered by Peter Cleaveland and Stan Bunger and gave us a glimpse into a simpler time when radio was in its’ infancy. The Lone Ranger’s “Telltale Bullet” had just the right voices and sound effects to magically transport the spellbound audience back to those thrilling days of yesteryear. The cast of Fred LaCosse, Matt Elmore, John Erlendson, Jan Erlendson, Dave Parker, Peter Cleaveland, Michael Bennett, Bob Brown, Dan Odum with Live sound effects by Linda Odum, recorded sound effects by Dennis Brown and Recorded Music by Bob Brown really brought this episode to life with a polished and professional production. CHRS is always so happy to have the Legends as part of Radio Day. And then we had Live music. 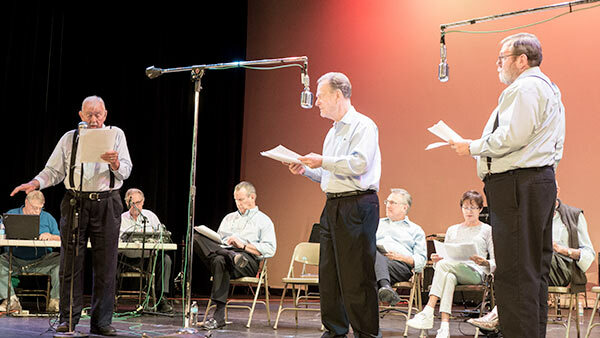 The sweet sounds of the Golden Gate Radio Orchestra under the direction of Steven Reading filled the Kofman Auditorium with nostalgic music that would have been heard in Live radio studios and on the air from the 1920s through the ‘50s. The GGRO is a 19-piece re-creation of the versatile radio station or network ‘house orchestra’, with the full-bodied sound of violins, woodwinds, brass, percussion, and vocalists. 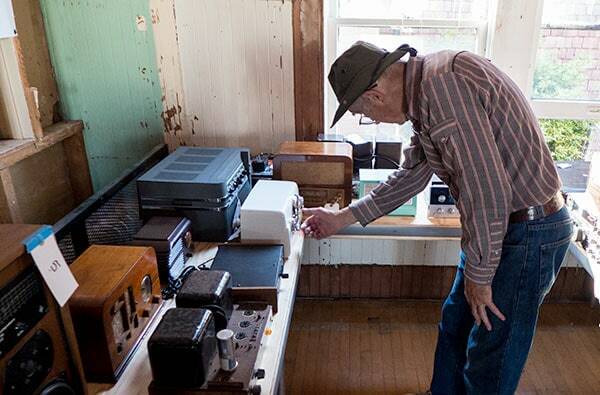 What a great sound and a great fit the GGRO was for Radio Day and CHRS. 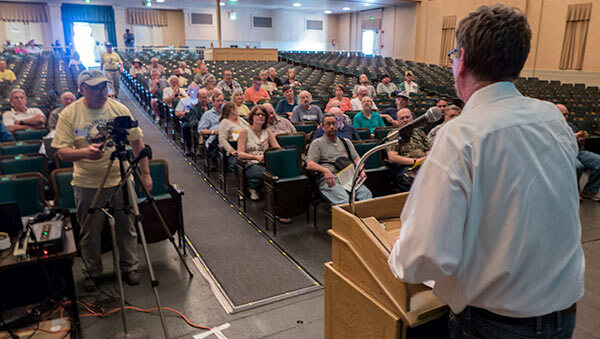 Thanks to all the members of the Golden Gate Radio Orchestra for their participation. All the feedback was so positive and requests have already been made to have the GGRO perform at our next Radio Day. Also at the Kofman, the SF Chronicle’s Ben Fong-Torres, BARHOF Class of 2010, and Bay Area Radio Hall Of Fame Executive Director Len Shapiro announced the voting results and the BARHOF Class of 2014. There was much surprise and delight as auctioneer Peter Finch’s name was announced in the News Category. Also, Super CHRS Volunteer Seth Arp was announced as the CHRS Volunteer of the Year for 2014. Seth mentioned how much it meant to him and reminded us that our volunteers really make CHRS thrive. And in the Kofman lobby, Ekkehart Willms presented his extraordinary vintage microphone collection. Just down the street at Radio Central we had all the auction items on display and we held our enormous Electronics Flea Market. 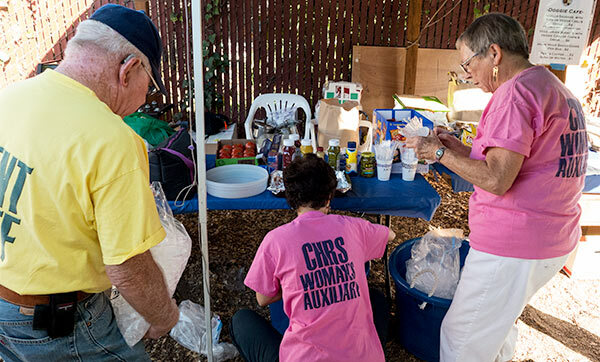 Also our Doggie Café and CHRS bake sale served up some tasty items and fed lots of hungry and thirsty Radio Day guests. We had a good turnout and everyone seemed to have a great time. Spotted in the crowd were Legends Mr. & Mrs. Fred Pardini with Legend and new CHRS Member Don Sanchez. So, for planning and preparation in a fraction of the time and experimenting with new procedures and two locations, CHRS is very pleased with the results. None of this could have happened were it not for the group of almost 40 dedicated and passionate Event Volunteers. We heard lots of good comments and suggestions for next time and have already discussed ways to make Radio Day By The Bay 2015 even better. And finally the bottom line… For all our hard work, CHRS netted over $25,000 for this year’s Radio Day By The Bay! 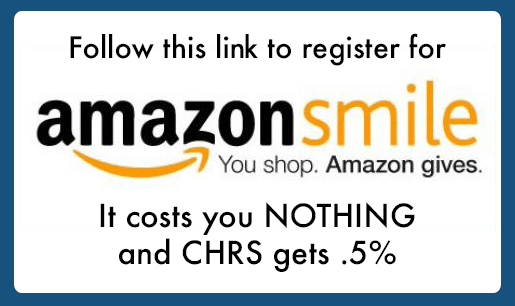 Thank you to everyone who participated and supported CHRS. 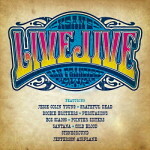 See you next July… LIVE! In Alameda. Now available for your viewing pleasure are Radio Day 2014 videos shot edited and posted on YouTube by Dave Billeci.